He was born in 1863 in Cologne to Johann Marx, the rector of a Catholic school (1822-1882) and his wife, Gertrude (1826-1909). He had a sister, Barbara, who later headed the Cologne Ursulines. Marx passed his Abitur at the Marzellengymnasium in 1881. He then studied jurisprudence at the University of Bonn from 1881 to 1884. As a student he became a member of Katholischer Studentenverein Arminia Bonn (a part of Kartellverband). Marx married Johanna Verkoyen (1871–1946) in 1891, and they had a total of four children (three sons and a daughter). In 1888, he passed the Zweite Staatsprüfung for the Prussian civil service and began working as an assessor in Cologne and Waldbröl and later in the land registry in Simmern. In 1894 he became a judge at Elberfeld. In 1904, Marx became Landgerichtsrat at Cologne, in 1907 Oberlandesgerichtsrat at Düsseldorf, in January 1921 Landgerichtspräsident in Limburg an der Lahn and on 27 September 1921 Senatspräsident of the Kammergericht Berlin without the requirement to serve the same day that he was elected president of the Reichstag fraction of the Centre Party. Under the German Empire, dominated by the Protestant Prussia, his religion and political activities were a handicap for his career as a lawyer. Marx started his political activities in Elberfeld, where he became active in the Centre Party. From 1899 to 1918, he was a member of the Abgeordnetenhaus, the lower chamber of the Landtag of Prussia. From 1899 to 1904, he was the head of the Elberfeld Centre Party. From 1906 to 1919, he was the deputy head of the party in the Rhineland. In 1907, he became the chairman of the Düsseldorf Centre Party and in 1910, he presided over the Augsburg Katholikentag. From 1910 to 1918, he was a member of the Reichstag. In 1911, he founded the Katholische Schulorganisation to fight against the secularisation of the German school system. Marx was elected to the Weimar National Assembly in 1919 and then to the reconstituted Reichstag in 1920, where he remained until 1932. He supported the Reichstag Peace Resolution of 1917 and opposed demands for territorial gains from World War I popular among Rhineland Centrists. Marx also opposed the German Revolution but supported the new Weimar Republic. The Weimar constitution granted Catholics full civil rights, unlike the previous constitution. Marx opposed separatism in the Rhineland and argued against the creation of the Rhenish Republic in December 1918. In the summer of 1919, Marx was one of the few Centre Party members supporting German signature of the Treaty of Versailles, as he feared that failure to do so would result in French annexation of the occupied Rhineland. After Karl Trimborn [de], Eduard Burlage [de] and Matthias Erzberger died, Marx became the head of the Reichstag fraction of the Centre Party on 27 September 1921 and, on 17 January 1922, party chairman. He supported Chancellor Joseph Wirth in his Erfüllungspolitik which attempted to comply with the Treaty of Versailles, notably the reparation demands of the Allies, as far as possible. Chancellor Wilhelm Cuno received Marx's help in mobilising civil disobedience against the Occupation of the Ruhr. However, Marx then helped to replace Cuno's cabinet with the Grand Coalition headed by Gustav Stresemann. When Stresemann's government fell in November 1923, Marx himself stepped up. On 30 November 1923, Marx formed a minority cabinet based on the Centre Party, DVP, BVP and DDP. Then, the financial and economic situation of the Reich was dire, and the central government's authority was challenged by right- and left-wing state governments as well as by separatism in the Rhineland. The cabinet's achievements included stabilizing the currency following the introduction of the Rentenmark, fiscal consolidation, the resolution of the conflict between the Reich and Bavaria's right-wing government and de-escalation in the occupied territories. In January 1924, the Emminger Reform replaced the system of trial by jury in Germany with a mixed system of career and lay judges. Following the May election, the second Marx cabinet was formed on 3 June 1924. It was once again a minority government, based on parties that did not have an outright Reichstag majority; it lasted until December 1924. Its focus was on relations with the Allies and on regaining control of the occupied territories in the west. In August, the government signed up to the Dawes Plan on reparation payments. After the December Reichstag elections, Marx was unable to form a cabinet and resigned on 15 December 1924. He remained in office as caretaker until 15 January 1925. In social policy, Marx's first period as Chancellor saw the introduction (in 1924) of family allowances for state employees. In February 1925, Marx became Minister President of Prussia, following a call by the Centre Party in the Landtag. On 18 March, his party nominated him for the presidential election following the death of President Friedrich Ebert. In the first round of voting, Marx was the Centre Party's and, in the second round, the entire Weimar Coalition's candidate. Marx received close to 4 million votes in the first round. However, in the runoff he was defeated by Paul von Hindenburg, as Ernst Thälmann the Communist candidate also stood and split the vote. In addition, the BVP had called on its supporters to vote for Hindenburg. Marx lost by 13.7 million to Hindenburg's 14.6 million votes. In April, Otto Braun replaced Marx as Minister President. Marx resigned after he had been unable to form a working cabinet. Marx considered leaving politics but on 26 January 1926 he accepted an appointment as Reichsminister der Justiz (Minister of Justice) and Minister for the Occupied Territories, in the second cabinet of Hans Luther. 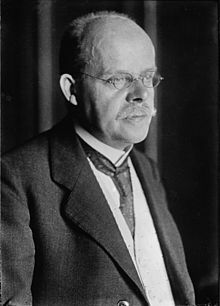 After Luther's government fell, Stresemann suggested Marx as chancellor and Hindenburg appointed him on 17 May 1926. Marx kept in place Luther's decree on the flag (Flaggenstreik [de]), which had resulted in the previous cabinet's demise. Marx's cabinet unexpectedly survived the referendum on the expropriation of the princes and succeeded in bringing Germany into the League of Nations. Marx also managed to force military commander-in-chief Hans von Seeckt into retirement without provoking resistance by the Reichswehr. He resigned as chancellor on 17 December 1926 over a lost Reichstag vote on the issue of clandestine military relations between the Reichswehr and the Soviet Union. The Social Democrats, who had brought down the cabinet, thereby ruled themselves out of a role in the next one. In January 1927, Marx formed a new government with participation by the far-right DNVP. This fourth and final Marx cabinet extended the Republikschutzgesetz [de] (including the ban on the former emperor to enter the country), and passed a law on working hours (14 April 1927) as well as the Gesetz über Arbeitsvermittlung und Arbeitslosenversicherung of 16 July 1927 which established a comprehensive unemployment insurance system. The same year, the government sought to standardize locally administered poor relief payments by fixing them in line with the prices of essential goods. The same year, Germany became the first major industrial nation to sign the Washington Agreement for extended maternity leave. Although the coalition broke up over the issue of the Reichsschulgesetz (school law) and the blame was put on the DVP, it was mostly internal opposition within the Centre Party, notably by Joseph Wirth, Adam Stegerwald, Heinrich Imbusch [de] and Theodor von Guérard that resulted in the cabinet's fall. Marx resigned on 12 June. After putting into action an emergency program, Marx was finally dismissed as chancellor by Hindenburg on 29 June 1928. In total, his four terms in office made him the longest-serving Reichskanzler of the Weimar Republic. After the Centre Party's poor performance at the polls in May, Marx eventually also resigned, as party chairman, on 8 December 1928. He then focused on work for numerous associations and civil organisations. In 1932, he resigned his seat in the Reichstag and retired. During Nazi Germany, Marx was charged in the so-called Volksvereinsprozeß (named after the People's Association for Catholic Germany which he had chaired) in 1933, but the charge against him was dropped in 1935. After the end of World War II, he continued to live in Bonn, where he died in 1946. Marx is buried at the Melaten-Friedhof of Cologne. 19 January 1928 - Wilhelm Groener succeeded Geßler as Minister of Defence. ^ a b c d e f g h i j k l m n o p "Biografie Wilhelm Marx (German)". Bayerische Nationalbibliothek. Retrieved 13 July 2015. ^ a b "Biografie Wilhelm Marx (German)". Deutsches Historisches Museum. Retrieved 13 July 2015. This page is based on the Wikipedia article Wilhelm Marx; it is used under the Creative Commons Attribution-ShareAlike 3.0 Unported License (CC-BY-SA). You may redistribute it, verbatim or modified, providing that you comply with the terms of the CC-BY-SA.